A comprehensive point of sale, repair tracking, and business management solution developed for the retail repair industry. RepairQ focuses on automating your daily operations and is constantly adding features and qualified integrated partners. 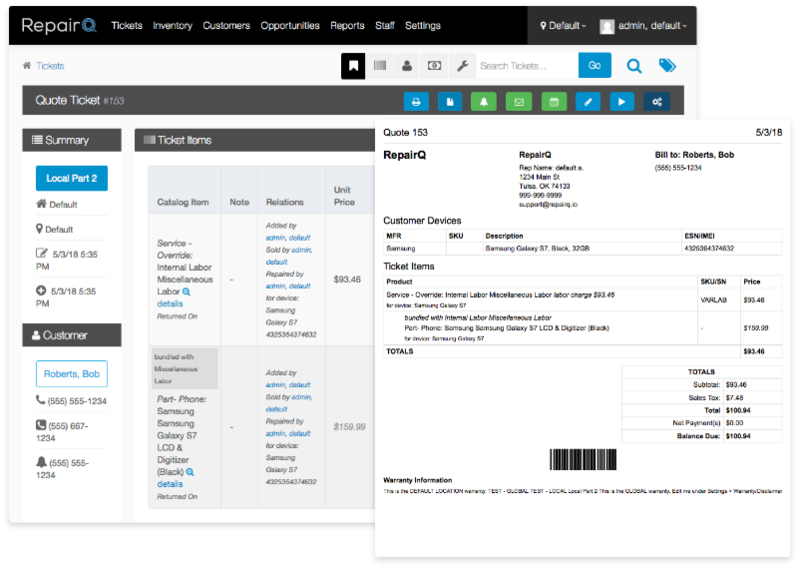 RepairQ offers Point of Sale, Ticket and Repair Tracking, Inventory Management, Enhanced Customer Relationship Management, Business Intelligence reporting, and so much more. 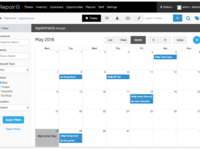 Start a free trial of RepairQ today or signup for only $37 a month! 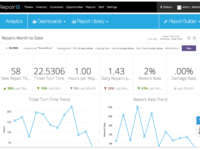 Pros: - Very user friendly and easy to implement in a growing organization. - need better French support, not just customer facing language. Pros: Easy of use. 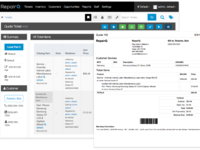 QPOP is great with customized forms and forward facing information. Cons: I believe not having the ability to take a CC payment on Invoices is crazy. This is a terribly inconvenient for locations that have large clients in their market space that want to pickup and pay. Secondly, if a device is invoiced, it should NOT stay in the queue. This is terrible from an overbite perspective. I understand if they stay listed for an admin, but not staff level. All this does is muddy up the queue with devices that are complete. If they are complete and invoiced, they should be removed. Overall: Both issues above are very problematic. That stated, we have enjoyed the easy of use of the system. The Bluefin integration has been great and at a lower cost than other solutions. Customization and the Qpop are used daily and great features. Jeffrey, thank you so much for your feedback! I'm glad to hear you've found our software simple to use for your business and enjoy our unique point of purchase tablet app, Qpop! 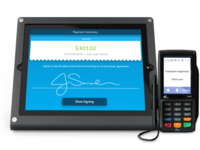 Regarding your comments, we are pursuing several new features this year for invoicing and absolutely agree that payments online is important. We don't have a timeline yet, but it is on the list. Regarding how items like invoices show in a queue, we have a great new feature coming in the next few months that will allow you to customize views of many common queues and lists. If you have other ideas or feedback, please feel free to contact us directly through email or phone and ask for James on the Product Team. Cheers! Pros: It is powerful for inventory management. Cons: The user interface is clunky, it could be more colorful or more exciting. There is no support for iPad/iPhone/Android. Sam, thanks for your honest feedback of RepairQ :) We're glad you love it but understand you have some ideas for how we can make it even better, especially our user interface and use on mobile devices. We believe there are several improvements we can make to streamline the user experience this year, but would love more specific feedback from you too. If you'd like, please feel free to reach out to us by email or phone and ask for James in the Products Team if you'd like to offer more suggestions. Cheers! Pros: Overall ease of use. Overall makes the day to day operations very easy. Cons: Would like to see more and better integrations. Ability to pull more detailed daily reports. Adam, thanks for the feedback and being a RepairQ customer! We're so glad you've had an excellent experience with our software. We also appreciate the constructive comments about integrations and reporting. We'd love to hear more specifics about the integrations you are looking for and the details within your daily reports you'd like to see in the future! Feel free to reach by email or phone and ask for James in the Products Team! Again, thanks for being a valued part of our community! Cons: It is missing minor abilities that would make its functionality so much more conveinent. 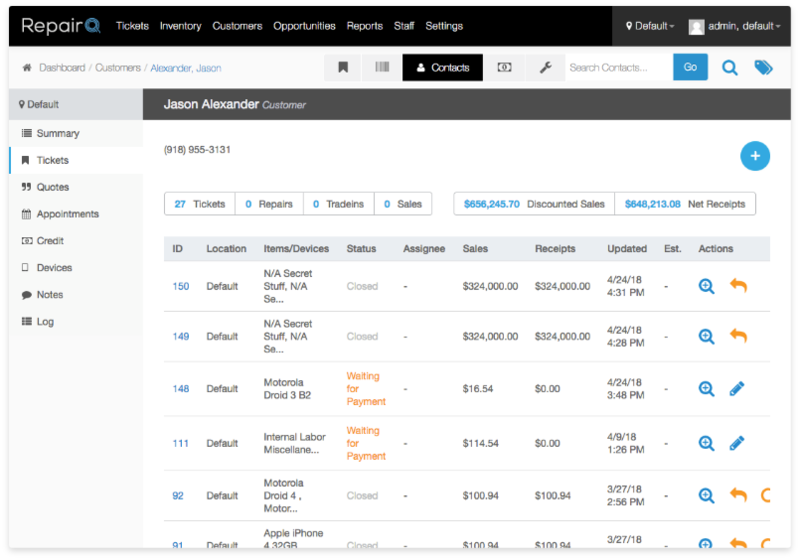 Overall: Overall, Repair Q is a great Software and it really helps when it comes to managing our shops and workflow. Alex, thanks for your feedback! 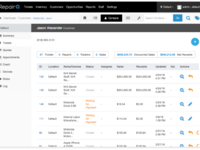 We're glad to heard that RepairQ has been a helpful tool for managing your business. We agree that there are several areas we can work on to improve convenience of the user, especially around the check-in and check-out process. We hope to continue to make improvements to this and other user experiences in few releases scheduled for this year! 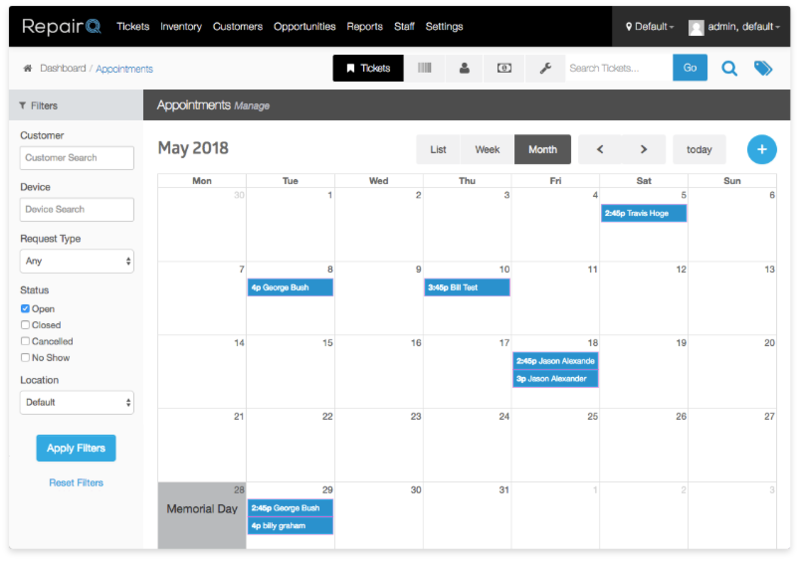 Pros: Awesome back end: inventory management, reporting, attendance tracking, integrations. Customer support came in clutch for me on New Years Eve of all days and I appreciate that. Cons: I'd like to see a bit more refinement on the process of checking in/out customers for repair just to be able to get people in and out as quickly as possible. I'd like to be able to use a companion app to be able to check the ticket que and some basic reporting for my store. There are a few tweaks to reporting that I'd like to see to match what I track more closely all in one place; all of the data is there, just some times I have to bounce around to a few reports to find it. Overall: Overall it has been a tremendous upgrade from our previous software and I'm very happy with Repair Q. More of our vendors are integrating so it's getting easier and easier to do business within the software. Pros: simply, it works. pretty much always. It never spit out reports or numbers i didn't trust. Cons: The feature set is lacking compared to competitors. I subscribed for several years and features that were "coming soon" when i joined still weren't launching. Eventually I gave up and jumped ship. Pros: I love the ease of keeping customer information and tracking repairs. Cons: We wish to be able to process gift cards but there is no easy way of doing it. Overall: We use RepairQ for checking phones in, following workflow, checkouts, keeping notes of diagnostics run on the phone and daily reporting. We are able to track inventory from the PO to being sold or returned. Thank you so much for your feedback Sandra! We really appreciate you using RepairQ. Pros: RepairQ is relatively feature rich. 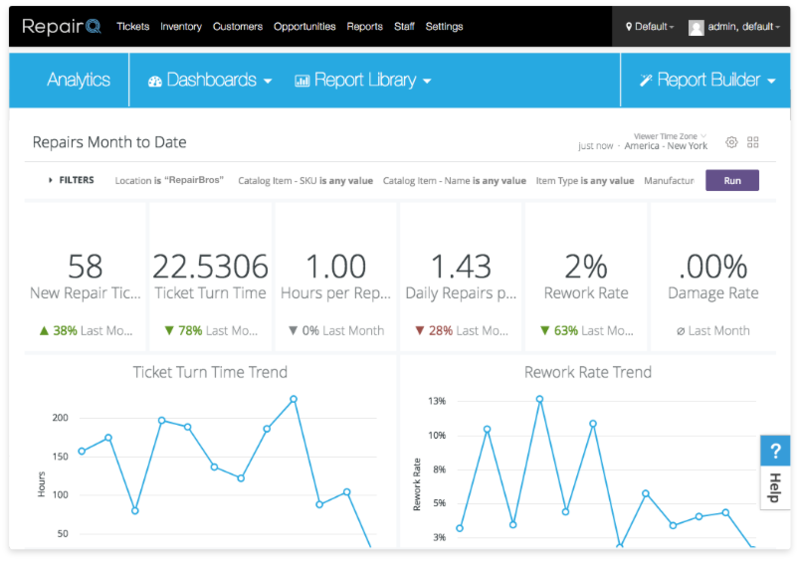 Most of what you want you can accomplish in a repair ticketing software. A few inventory related things are slightly funky but once you get used to it can do most of what you want. Cons: Glitches, poor UI, and more glitches. First, RepairQ is web based and as such frequently slows down to hilarious levels due to their poor hosting. Have a customer come in and you need to look at their ticket? RepairQ has your back and will make an incredibly long awkward silence while you login and try to search for their ticket. Second, inventory searching for attaching parts to tickets is very glitchy. You can type the SKU name, description or even the serial number in and it will start the little search spinning icon before deleting half of what you just typed in and saying nothing exists. It is incredibly infuriating having to type something in 6 times before it finally comes up because RepairQ deletes half your work. It feels like you are constantly fighting it. Third, thought this might be more related to our exact setup more than others, there are glaring security issues that have been brought up and have not been fixed despite responsible reporting. Hi Ben, according to our records, you may have been using a unique version of our software severals years ago and for a short period of time. It's possible that some of your experience was due to your particular situation, never the less, it's unfortunate that you did not have a great experience with RepairQ. Our products team is always interested in user feedback and constructive recommendations. If you're ever interested in sharing more details about your experience and suggestions with our team, please reach out to us by phone and as for James in the Products Team! 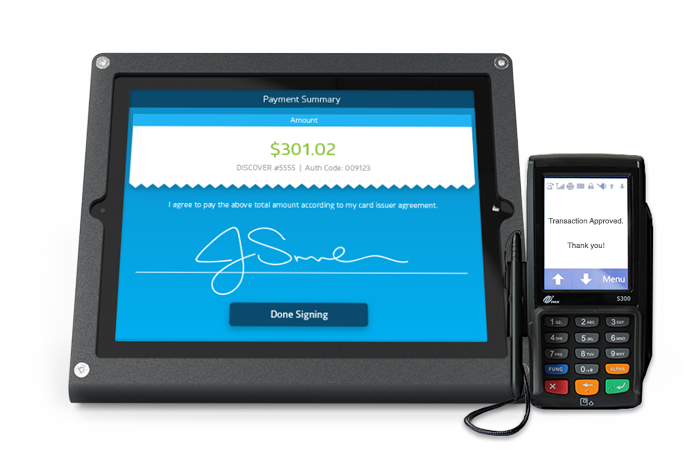 Pros: It is more polished than the other POS systems I have used. Overall: It's a smooth overall experience that allows up to project our professionalism through our receipts and invoices. Pros: In general the software is very user friendly. I love that parts can be marked as pulled to repairs even though they are not yet sold!! Cons: Methods for bulk modifications are a bit complex. Mostly only an issue on setup.